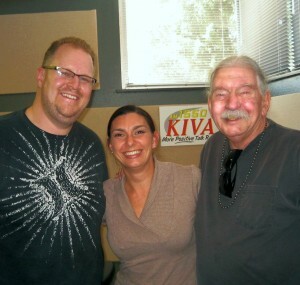 Ryan Scott, Nicole Villareal, and Larry McGoldrick at the KIVA studio just after the Break The Chain broadcast. Nicky V’s Neighborhood Pizzeria is not your ordinary pizza parlor. 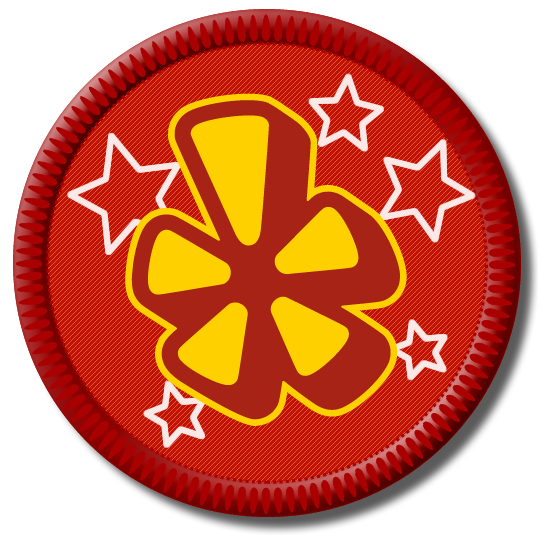 Quite the contrary: it is the place to go on the West Side for a top-notch Italian gastronomic experience. That’s pretty high praise, even from me. 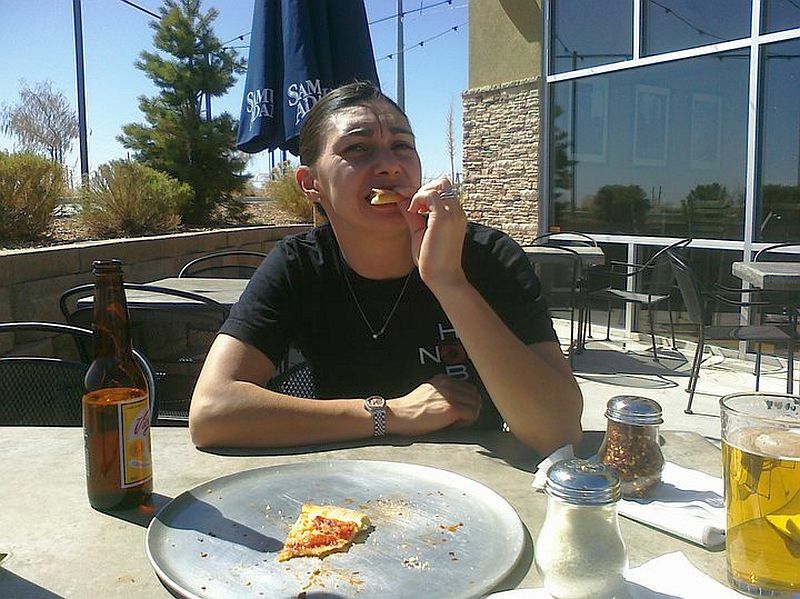 Albuquerque has a glut of pizzerias. Some great; some not even good. You probably have your favorite, and since pizza is such a personal preference, bordering on religious, I am not here to tell you that you are wrong, because you’re not. If you love pizza and other Italian delights, you owe it to yourself to try Nicky V’s. Nicole (Nicky) Villareal has put together a sure-fire winner. The restaurant and siting are beautiful, situated in a location abandoned by a failed pizzeria (which shall remain nameless here to protect the guilty). Lots of glass and a patio afford fine views across the valley toward the Sandias. She chose her kitchen and serving staff wisely — they really know what they are doing. I dare you to keep from drooling on the menu as you read through it. Is the food any good? Yup. Fantastic. Here’s what we had for our first visit. Appetizer: Ravioli Friti — Fried ravioli with warm marinara. Five cheese ravioli gently fried to a light golden tan were stuffed in a wrought iron cone. Finger food that you dip in a very good marinara. Great. Salad: “Della Terra” — fresh herbs, endive, apples, radishes, toasted almonds, and gorgonzola crumbles, tossed in a blue cheese vinaigrette. Very good, but a tad too piquant for Jane’s tastes; she is eager to try some of the others. Pizza: Lucca — Red sauce, Italian sausage, pepperoni, bacon, and oregano. For this first visit, I wanted to try a pizza that I was familiar with. Red sauce and meat. This creation is as good as any thin-crust Chicago pizza that I have ever had anywhere (including Chicago, where I lived for fifteen years). The sauce is sweet, but not too sweet, and spicy, but not too spicy. Goldilocks would have loved it. I sure did, and so did Jane. Simply a great pizza. On a return visit (March 4), we were served by Wendy, the charming and effervescent manager and the only floor person not dressed completely in black. She suggested Il Adelaide paired with a lovely 2008 Santa Christina Sangiovese for me and Gnocchi with a nice Pinot Grigio for Jane. 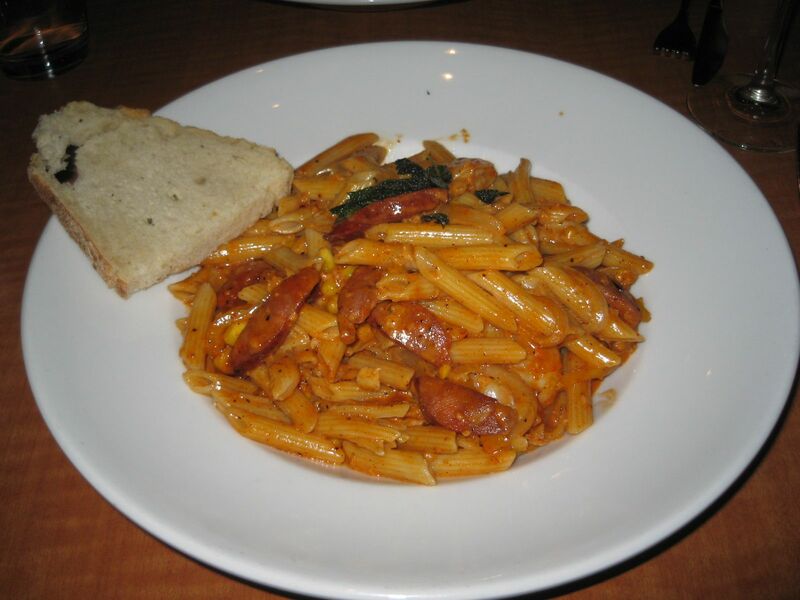 Il Adelaide – garlic, yellow onions, marinated prawns, roasted corn, bell peppers and andoulle sausage in a delicate and spicy pasta cream sauce. The prawns were beautifully done — excellent taste and texture, spicy shrimp. The anduoille was great — spicy with a delicate thyme aftertaste. An excellent dish.Pair it with a lovely 2008 Santa Christina Sangiovese.Nicole tells me that this dish is named (by the chef) after Nicole’s daughter. The chef calls her a spicy shrimp. Lucky kid. Gnocchi – roasted chicken, artichokes, grilled leeks, and spinach served with gnocchi in a roasted pepper parmesean cream sauce drizzled with truffle oil. Jane loved this dish. Delicate and beautifully done. This is not your Italian Grandma’s red-sauce gnocchi, but a worthy upgrade. Grandma would have loved it, too. Pair it with a Pinot Grigio. Nicole’s artistry may lure me away from my usual Friday night Fourth Street restaurant crawl. 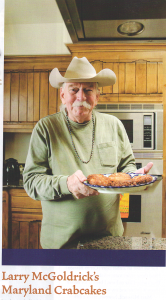 Look for the cowboy hat when you go to Nicky V’s. That’s probably me trying some of the pasta dishes as I eat my way through the menu. Orvietto pasta, amazing and original! I can’t rave enough about Nicky V’s Orvietto pasta. Pancetta, crimini’s, peas, cavatappi noodles in a beautiful reduction of sauces, and finished with pinon and fresh herbs – amazing, spectacular, and all those other superlatives. Several gastronome friends have told me that this is the best pasta dish that they have had anyplace, and they’ll get no argument from me. Nicole cracked a bottle of Layer Cake Primativo from Puglia (a ruby Zin) for us and poured Jane and me each a glass. Almost ideal pairing. I think it was a 2006. I speak of Maryland Crabcakes with awe and reverence. 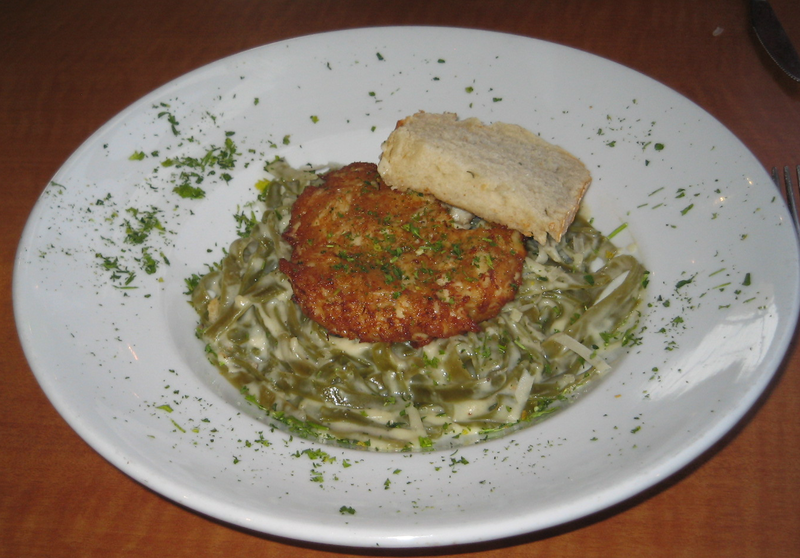 Had you, as did I, followed Nicky V’s facebook page (and you, too, should), you would have noticed that her special one weekend was Maryland Crabcake atop Spinach Fettuccine Alfredo. No other restaurant in Albuquerque serves Maryland Crabcakes. Nobody even comes close. And now you don’t have to go to Maryland to sample these patties of perfection. You can get them at Nicky V’s, where they are served atop an incredibly good Spinach Fettuccine Alfredo. I, as an ex-pat Marylander, initially balked at this combination, purist that I am. It is, however, superb. My three-quarters-of-a-century-old bones were bathed in celestial sounds as I first bit into this amazing combination. Some words about old dogs and new tricks should go here — you make them up for me. Be gentle. 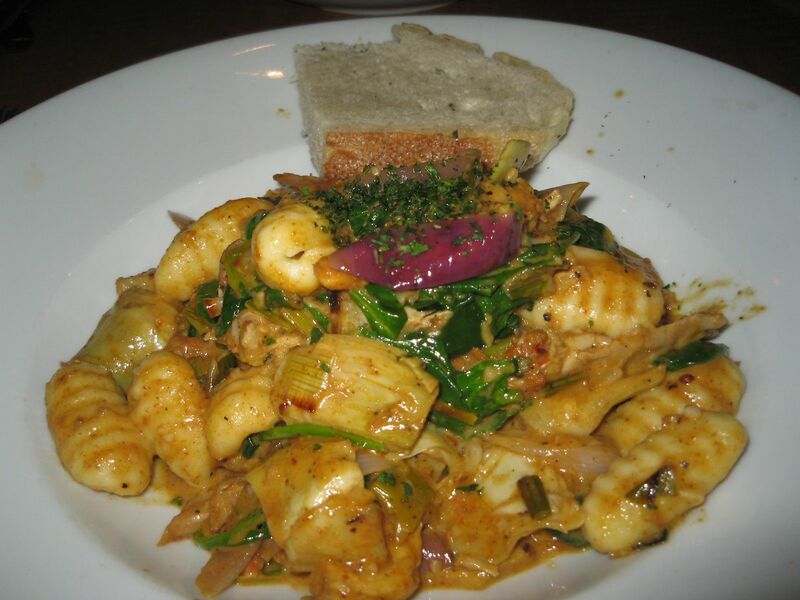 A common misconception is that you can’t get excellent diet fare at a pizza/pasta house. Nicky V’s puts the lie to that statement. Several weeks ago as Nicole, Jane, and I were driving beck to her place after an exciting radio interview hosted by Ryan Scott of Break The Chain, Jane and I lamented that our rigid new diet (Dukan) would keep us out of Nicky V’s for many months to come. Nicole, of course, knew better. She rattled off a list of no-fat, no-carb dishes that they would make for us. 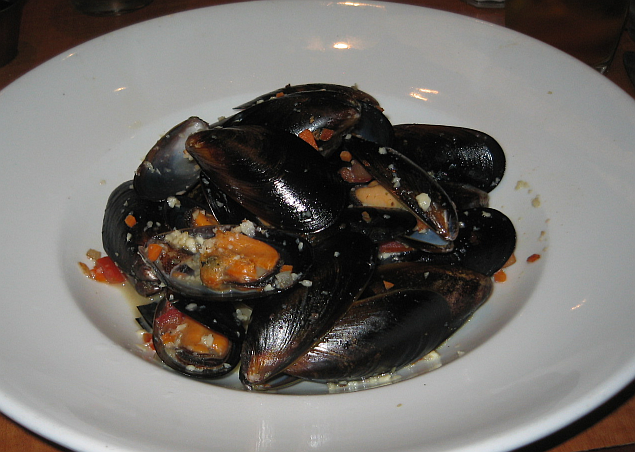 The following Friday, we showed up and arranged with Wendy, her house manager, to feast on Mussels di Sicily. A full pound of mussels, diced tomato, onion and garlic steamed in white wine and a splash of our cream sauce, the finished with fresh herbs and two slices of garlic bread. Wendy’s suggestion was to forget the cream sauce and the garlic bread. We accompanied the mussels with a simple salad of greens with some sauteed shrimp. The mussels were superb. Beautifully done, tasty and succulent, suitably garlicky, no sand, and they became an instant hit. The cream sauce was not missed. The salad was good, but not great. 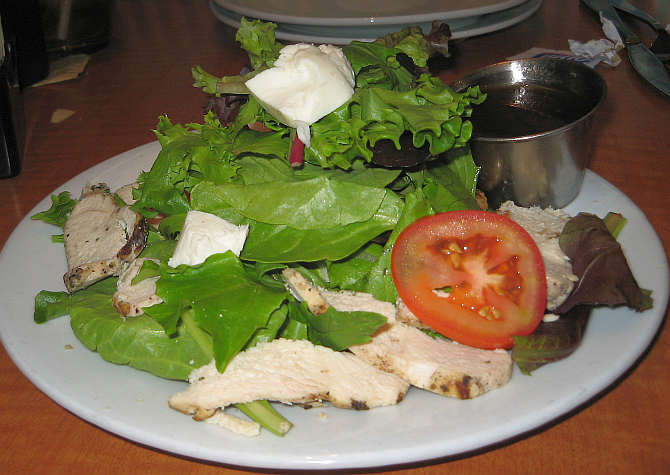 We came back the following Friday, and our server, Jake, agreed that the salad accompanying the mussels would be better with sliced chicken breastinstead of shrimp, and he was right. Very good this time. Jake told is that the Mussels di Sicily is their third-most-popular appetizer, just behind the Raviolo Fritti and the Frito misto, both of which are superb. This great meal may become a Friday night custom until we reach our goal weights. Then it’s back to the Orvieto Pasta, the best pasta dish in New Mexico. 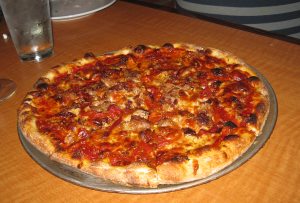 Pizza Tre—Red sauce, Italian sausage, cheese blend, roasted red peppers, oregano. This is as close as you can get to the classic Italian sausage pizza that you get when you are in Chicago (I lived there for fifteen years). Thin, light crust that actually tastes great all by itself, slightly spicy sausage, and a delicious red sauce that will tickle your palate. Makes you forget that you are in the Land of the Green Chile. Destined to be one of my Duke City favorites. This dish is playfully named after Nicole’s son (Tre, not pizza). Lucky kid. 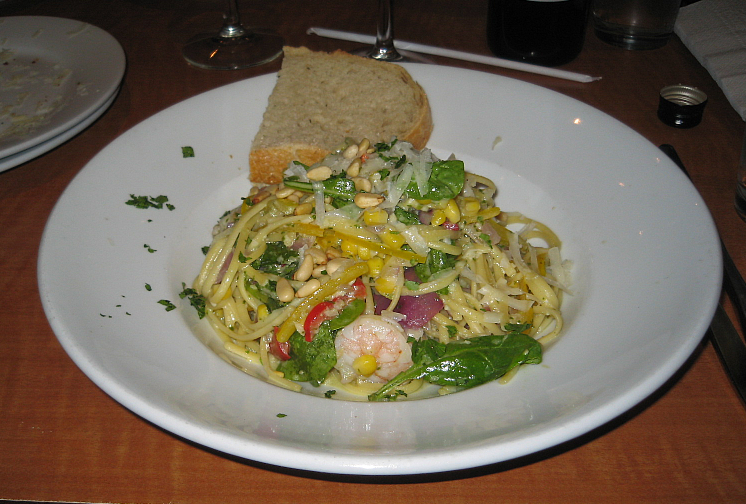 Linguini with Prawns—Linguini, prawns, pesto, spinach, sweet red peppers, corn, and a hint of red onion. This dish is stunningly good. The blend of the ingredients provides a balanced combination of tastes that really satisfy the palate. The prawns are not overcooked and remain quite succulent. Corn kernels in a pasta dish may seem like starch overkill, but it works better than I thought it would. This is a highly unusual and thoroughly wonderful dish. But then, I have come to expect that of all Nicky V’s pasta dishes. Completely out of the ordinary. It screams out for a big red Zin, like the Layer Cake Primativo (2008) from Puglia. Greay pairing. Nice with the pizza, too. My friend Gil Garduño rates Nicky V’s a 22. Several of my gastronome friends allow that the Orvieto Pasta is the very best pasta dish that they have had anywhere. I agree, and have said this on the air during a Break The Chain interview (the recording is available on this blog), shared with Nicole. My good friend and crony-in-aging, Corrales Willie Kent, went to Nicky V’s on the day after the broadcast and ordered the Tre Pizza, which he declared the best pizza he has ever had in New Mexico. High praise from a Chicago deep-dish-pizza fan. And he lived there even longer than I did. Oh yeah—The New Mexico Parrotheads went crazy during a recent happy hour there. Nicole prepared Green Chile Cheeseburger pizzas for the group. They were amazing. This entry was posted in Diet Friendly, Italian, Pizza. Bookmark the permalink. I almost went here during a recent visit to ABQ, but only had enough time to get a slice, which they don’t serve. I will, however, give it a try on an upcoming trip. A native New Yorker, I no longer subscribe to the New York vs Chicago as the only types of pizza. instead, i have grown very fond of any smallish, gourmet (ambiguous term) pizzas often cooked in a brick oven. I’m glad I found your blog as I needed recommendations for Mexican food and am following your recommendation in your Top 10. Over time I,ve had theAdelaide & orvietto dishes, albeit I dislike unipasta dishes-I’ve compensated by adding a 1/2 house salad! Muy sabrosa! I dare ya to çhallnge Larry’s pick of the Lucca pizza if that what ya be into!!! Hard to argue The Larry! !